The Black Armband thrives, it seems. Not the Black Arm Band – which gets to play its 10th-anniversary concerts soon. Rather the school of historical study that hit the headlines in the 90s under the leadership of Henry Reynolds to give the band its name, but which was roundly condemned by then Prime Minister Howard as “history being re-written in a partisan political way; contemporary standards being imposed upon the past. The balance sheet of our history”, he trumpeted, “is one of historic achievement”! That was the rival White Blindfold reading of Australian history, a fight-back lead by Keith Windschuttle. Now we've moved out of academia, out of the bush where the Black survivors of white massacres always knew their history, into the urban art institutions. And this inevitably involves urban Indigenous curators and artists somewhat belatedly catching up with earlier remote artists and shows such as 'Blood on the Spinifex' in 2003 at the Ian Potter Museum in Melbourne and 'True Stories' the same year at the AGNSW. Both emerged from that brief art flowering in the East Kimberley at Jirrawun Aboriginal Art, upon which I shall expand later. Today, the AGNSW has 'When Silence Falls', curator Cara Pinchbeck's amassing of both local and international art from the Gallery's collection that tells of the brutalities of colonialism wherever it happened – South America, South Africa, South Asia or South Arnhemland. Then the dynamic Campbelltown Arts Centre has localised its point of attack to commemorate the 200th anniversary of the nearby Appin Massacre, one of the earliest such horrors in 1816, revealing that this was no wild action on the distant frontier by aggrieved 'pioneers', taming the land and the natives, but an official military action ordered by the government of Lachlan Macquarie. More familiar, the Myall Creek Massacre in 1838 is New South Wales's most well known. It held a Memorial Ceremony on site at Bingara last June, but is coming to town with a Symposium at Parliament House on May 11th. Myall Creek and Appin descendants, MPs and Canberra Tent Embassy vets will take part. The message of the event is, “There is a momentum towards recognising the true nature of colonisation in Australia. The nation is looking for leadership on this complex and confronting issue, without which we will keep sabotaging our national aspirations and dreams”. Can art achieve that leadership? I guess I have doubts after viewing 'When Silence Falls'. Perhaps closest to it was the non-Indigenous Ben Quilty with his major work, 'Fairy Bower Rorschach' from 2102. For this gave the exhibition its name by showing a gushing waterfall at Bundanoon in the Southern Highlands where he lives, once a traditional home for Aboriginal families, children playing and women singing, deserted and silenced by an 1834 massacre. “All that was left was the sound of running water”, says the text. But of course, the painting lacks even that – the silence is ear-splitting. Many others tried – Tony Albert, Daniel Boyd, Vernon Ah Kee's 'Brutalities' – without which no such show can occur these days – Judy Watson, Fiona Hall, William Kentridge and Doris Salcedo, etc. But it's so hard to report massacres movingly. Judy Watson's luminous canvas, 'a picnic with the natives', has a great title, using a euphemism for massacre from the Gulf Country. But its inviting blue/green backdrop to a series of red-dot-on-white mappings of reported massacre sites offers no pain at all. It simply doesn't carry the weight of Amanda Peacock's commentary: “The painting recognises and mourns the dead, remembering the period of violent dispossession and attempted erasure of Indigenous peoples and cultures upon which the modern Australian nation is founded. The history is in some sense our original sin, one that we must recognise before we can mature as a nation”. By the way, Watson is starting a website - http://thenamesofplaces.com/ - which intends to list massacre sites nationally, uploaded by anyone who has knowledge of such killing. This will be a distinct challenge to the Windschuttle rejection of the validity of oral history-making. But it may have the advantage of involving direct descendants of victims rather than indirect reporters. 'With Secrecy and Despatch' is the name of Campbelltown's response to the little-known Appin Massacre in 1816, using Macquarie's own words from his instructions to get out there and “rid the land of troublesome blacks”. Specifically, those that ran from the advance of the three regiments sent to Appin were to be shot and “hung from the trees in prominent positions to strike fear and terror amongst the surviving population”, or driven over the cliffs above the Cataract River. Survivors were to be brought into “places of security” at Parramatta and Windsor. A revelatory side of a Governor we tend to associate with the elegant buildings in Macquarie Street. Tess Allas was its Indigenous curator in a three-year project which also included a Canadian curator and four Canadian Aboriginal artists. No explanation is offered for this potential dilution of the justifiable anger that the locals must have felt. But there are now on-going annual meetings and potential exhibitions involving Australian, Canadian and NZ Indigenes, so maybe it was part of that thinking. And in Cheryl L'Hirondelle's achingly sad 'Appin Nikamowqin', singing the land in her Cree language, the invitation was surely justified. The specifically Canadian massacre and smallpox pieces seemed out of place. But then quite a few Australian works came from a past before the horrors of Appin were widely known. There may be plaque erected by Wollondilly Council close to the site, but the major 2003 conference at the National Museum that was supposed to close the History Wars failed to mention Appin. So I assume a generic anger in Gordon Bennett, Robert Campbell, Milton Budge, Fiona Foley and Judy Watson's works, as well as in another appearance of Vernon Ah Kee's 'Brutalities', which for the first time revealed their roots in Jackson Pollock's drip and splatter paintings as the artist vented his spleen on those who are capable of yielding to the brutality required for such a massacre as Appin's. 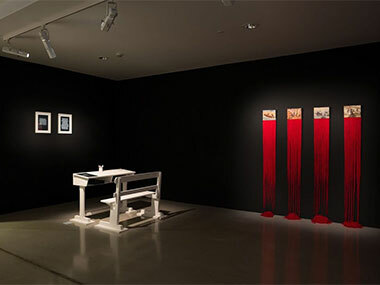 Standing out from the new works commissioned for this exhibition was Tony Albert's 'Blood Water' – using old tapestries portraying 'idyllic' Aboriginal scenes, but hanging red ribbons from them to the ground to represent both the blood and tears that must, in reality, have flowed. Jennifer Herd's north Queensland rainforest shield patterns pricked out on paper were an effective variation on the many South East artists using shields to represent resistance, were made more Appin-applicable by the words of a 19th Century explorer: “Their shields may answer very well for the purposes of their wars, but my rifle drilled through these as if they were sheets of paper”. Finally, Frances Belle Parker managed precisely as her title, 'Tears will flow at the blood shed' indicates, to suggest that multicoloured downward flow in across 20 canvases – one for each decade since 1816. Was I moved by this accumulation of feeling? The setting certainly helped; Campbelltown has big rooms and they refused to crowd them, they darkened them, a particularly joyless 'God Save the Queen' played occasionally as the old girl celebrated her 90th birthday, and films showed me both the implacable cliffs where the Appin action took place and the relentless march of mindless suburbia on to Dharawal Land. I was certainly better informed. Both of these exhibitions also had Gija art from the East Kimberley where such massacres are almost within living memory. And viewing works by Rover Thomas, Queenie McKenzie and Freddie Timms at Campbelltown, and by Paddy Bedford, Rusty Peters and Timmy Timms at the AGNSW, might suggest to viewers that the artists took a remarkably dispassionate approach to such terrible events that affected their parents' generation. Paddy Bedford, for heaven's sake, was named Paddy after the man (Paddy Quilty) who'd committed the Bedford Downs massacre, who happened to ride past just after his bush birth and demanded he be given that name. But Bedford's paintings of such events don't actually differ in style from his mythological site paintings or his personal history works. Indeed, massacre subjects disappeared from his work after a certain time. 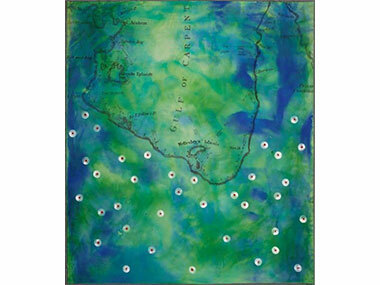 Not that you'd know that at the AGNSW, where curator Pinchbeck places Bedford's work 'Untitled (Old Bedford)' in his massacre opus, saying, “the artist gives form to the country where the massacre took place overlaying this with aspects of the Ngarranggarni that reveal his relationship to place”. Sadly, that's quite wrong. I know because I've been to Old Bedford with Paddy Bedford. It's the site of the original manager's house on the station, with little to show for it now. Paddy was flying me around in a helicopter to visit significant sites from his life and his faith for the last time, eagerly recording his memories of their relevance for the Gija linguist, Frances Kofod. On my return from this moving experience, I wrote a particularly colourful essay for an exhibition at the William Mora Gallery in Melbourne. “At Old Bedford, for instance, the patch of open ground beside a treed billabong revealed no hint of habitation apart from half a heavyweight horseshoe. But Paddy Bedford seemed to see a whole community of paperbark humpies in his mind's eye as he told of his mother being rounded up from the bush and brought in here for her first white contact. That became an intimate one as she moved in with the white station man and gave birth to one of the first 'half-caste' children locally. Neither side of the racial divide approved. The child was drowned by a senior Gija woman; and Paddy's Mum was rushed off to Moollabulla Station, which had the reputation of being little more than a concentration camp. So, no massacre there; just personal grief. Of course, Bedford did paint of the cruel deaths of relatives too; but only, I believe, as part of a process of removing the White Blindfold that had denied Kimberley massacres, even though the Duracks, reported by Mary Durack in 'Kings in Grass Castles', saw them as an inevitable part of protecting their herds and 'their' land from the people who'd lived there for millennia. To Bedford and his peers at Jirrawun Aboriginal Arts, getting their stories on the record and accepted by people like Jirrawun's Patron, Governor-General Sir William Deane was all they needed to reconcile their hurt and forgive. As I wrote in 2005 for William Mora, “But the Old Men (and Women) are fighting back. And that blighted word 'reconciliation' springs inexorably to mind as I analyse the creation of Jirrawun Arts, the zealous organisation that its President, Freddy Timms imagined eight years ago, which now has Sir William Deane as Patron and Paddy Bedford as its Manambarrany. The Old People's urgent need was to get the whole massacre thing out into the open, to get it accepted by white people, and then move on. What a model for the rest of Australia! First came the performance Fire, Fire Burning Bright. Such courage. At the opening of their joonba in Perth, cast members still feared that white West Australians might rise from the audience and shoot them down. In 2002! And we can't even say 'Sorry' officially. But having survived that, Paddy Bedford can now say to me, “That Paddy Quilty was only a little bit bad – he only did it once”! Sadly, Jirrawun's beauty didn't last beyond Paddy Bedford's death and the departure of facilitator Tony Oliver in 2010. But, in a sense, their battle had been won. The art continues unfettered by massacre concerns in the East Kimberley. 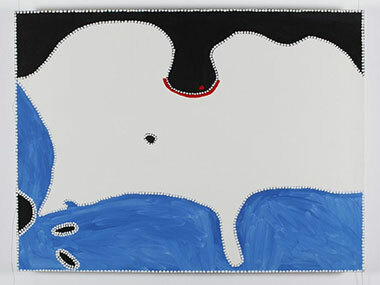 As Indigenous curator Stephen Gilchrist wrote in his 'Everywhen' catalogue for the show that runs until September at the Harvard Art Museums: 'Anthropologist WE Stanner coined the term,' The Great Australian Silence' (pace 'When Silence Falls') to describe the efforts by white Australians to avoid thinking about how Indigenous people were dispossessed or 'dispersed' (a euphemism for murder) from their customary lands. Unravelling Australian attempts to hide the country's history, complicity and amnesia, Bedford's painting destabilises the validity of official Australian propaganda, which presents the colonisation of Australia as largely conflict-free. 80 years after this event (the Bedford Downs massacre) when the artist felt safe enough to tell his story, the weight of this under-represented history poured out, a poetic eulogy in ochre”. Perhaps that's the way to do it? More poetry and fewer tears to shift that Blindfold.